Have you already participated in Craft Stamper May Take It Make It challenge? 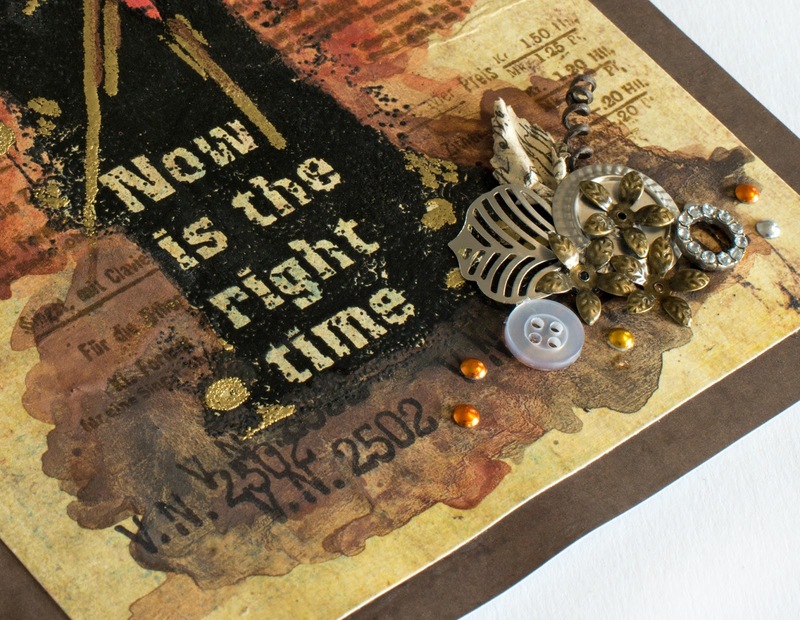 If not, now's the time to take out your stamps and get creative! There's still plenty of time to enter your projects, just make sure you add your project link to the TIMI challenge post latest on May 27! Again, our design team has created amazing projects for your inspiration. Check out all the gorgeous pictures here! 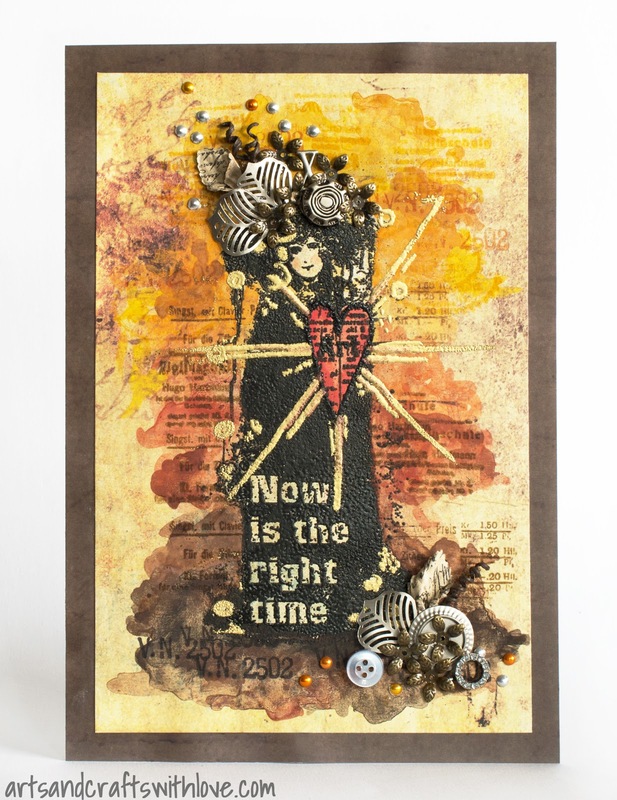 For my project I used a beautiful Prima stamp 'Now Is The Time', designed by talented Finnabair. I heat embossed the image with black embossing powder, as I wanted the result to be dark black. Another reason for using heat embossing was the need to create a resist for the watercolours I used on the background. I could have covered the image with masking fluid, too, but as the image was pretty large I thought heat embossing was an easier solution to protect the stamped image. The soft background paper is from Prima, too, and even it their papers do tolerate wet media I decided to cover the surface with clear gesso. Gesso allowed me to use plenty of water with the watercolours, and prevented the background from buckling too much. 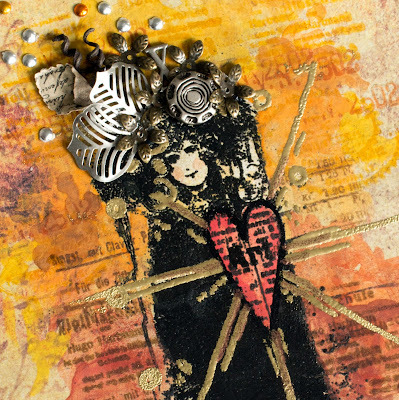 Once the background was dry I added more patterns with Finnabair's Vintage Vanity - Musica stamps. I also highlighted the beams, and heat embossed them with golden and bronze embossing powder. Before gluing down the embellishments I attached the picture first on brown cardstock and then on a piece of corrugated cardboard. The embellishments were not too heavy and could have glued down with Tacky Glue, but for ensuring that nothing would drop I used gel medium for attaching the little metal trinkets on my picture.